Here we are at week twenty-four. This will be the last pick-up for our half share members in Truffles’ group. 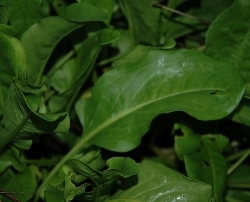 It will be sad to say goodbye, as always, but we hope to see you this winter if we have winter produce available. This week’s essay is a short list of some of the funny things that we have seen at the farm this season. I thought a comedy break might be in order to help combat the wet and cold. You will notice that these occurrences all involve a critter of some sort. I will call these occurrences “naughties” from this point forward. I am convinced all the different animals here at the farm are in one of three states of being at any given time: Resting from perpetrating their most recent naughty, actually performing a naughty, or planning their next naughty. The pigs are actively working on minor naughties on a daily basis, but a big one that sticks in my mind happened early this summer. It involved our sow Ginger who is very sweet and gentle and huge. I remember weeding in the onion patch at the time with Samson the farm dog calmly sitting in the golf cart supervising (sleeping). Or so I thought. I noticed out of the corner of my eye an orange movement in the peppers that indicated Samson had somehow removed his leash and was up to no good. When Samson barked from his seat on the golf cart, my mind went into crisis mode. It was an orange pig in the peppers! Along with three of his brothers and sisters! Followed by their momma Ginger! It is hard to think clearly when pigs get out and go visiting. Calmness prevailed, as it usually does when dealing with pig naughties, and Ginger casually followed us back to the barn with her piglets trailing behind. I think she just wanted to say hello and see what we were up to. Not a single pepper plant was harmed during the course of events either. Amazing. The chickens have been known to pull a naughty now and then, too. Individually, they are very sweet and docile and would never dream of going against the grain. But they know things. Like where the grain is located in the barn. So sometimes they reach a collective decision that it is time to make a raid on the barn. Their method is as follows: Bird number one jumps up and latches on to the top of one of the stakes supporting the net fencing surrounding their yard. This causes the fence to bend outward a bit. Bird number two jumps up and lands on the same stake just below bird number one. This causes the fence to bend halfway to the ground. Bird number three finishes the job with the same technique and the fence bends all the way to the ground. The rest of the group then scurries over the downed fence on their way to the various naughties they have planned for who knows how long. I think it’s a fun game for them to see who can be the last one to get rounded up by the harried farmers. Donkeys are naughty. I would not have suspected this since they are so cute and innocent looking. But every time we try to get them on some fresh grass they feel the need to be on different grass of their choosing. (The grass is always greener? )This, like the chickens, involves getting through the net fencing. But the donkeys don’t have a complex solution for achieving this; they just plow right through the fence and go on about their business. The game for them is to see how long they can remain undetected by the aforementioned harried farmers. They pulled this little stunt on Thursday morning, as a matter of fact, with a little twist. They broke out of their main pen! The solid fence made of steel cattle panels. This was quite an accomplishment. Near as we can figure, they just decided to go eat grass and proceeded to scratch and push the fence out of the way at one of the corners. What fun for donkeys! Especially since the halters were hanging on the barn wall which meant that, even upon discovery by the still harried farmers, there would be nowhere for those farmers to attach a lead rope. Once again, calmness prevailed. That or the donkeys had been out for hours and really just wanted to go back home. Either way, they cooperated nicely and allowed us to lead them back to their pen. They only demanded a little bit of hay. Here’s to hoping all your fences hold. Did you know the vast majority of organic pumpkin seeds sold in the USA are from Inner Mongolia and Eastern Europe? That I know of, there are no commercial sources of USA grown, organic, and raw pumpkin seeds. (Postlewait Farm in Oregon grows a hulless roasted variety, but they are not widely available.) 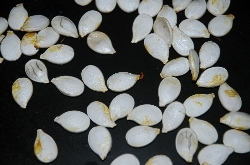 Renee Loux notes, “Pumpkin seeds are loaded with minerals like zinc, iron, magnesium and copper in a protein-rich crunch.” As I cook pumpkins, I wash and rinse the seeds, then leave them to dry on a plate on the counter. Once I’ve accumulated enough, I roast them or grind them raw with herbs and salt into a crumbly meal that I use like Parmesan cheese. Please don’t toss your pumpkin seeds, you have a treasure of hard to find nutrition right at your fingertips! Click here to read this week’s newsletter.